Reconfigurable wideband DSP hardware supports multiple loadable personalities by inserting a pre-programmed SDHC card. Each personality has a customized GUI, compiled using LabVIEW Application Builder and Matlab Complier so the end user doesn't require a commercial license. The Filter-Equalizer Personality includes a summary page for control of multiple filters and a detailed page for "draw your own reponse" equalization on each filter. Multiple stage filter design ranges from extremely narrow to wide bandwidth filters having programmable center frequencies from 20 MHz to 300 MHz. 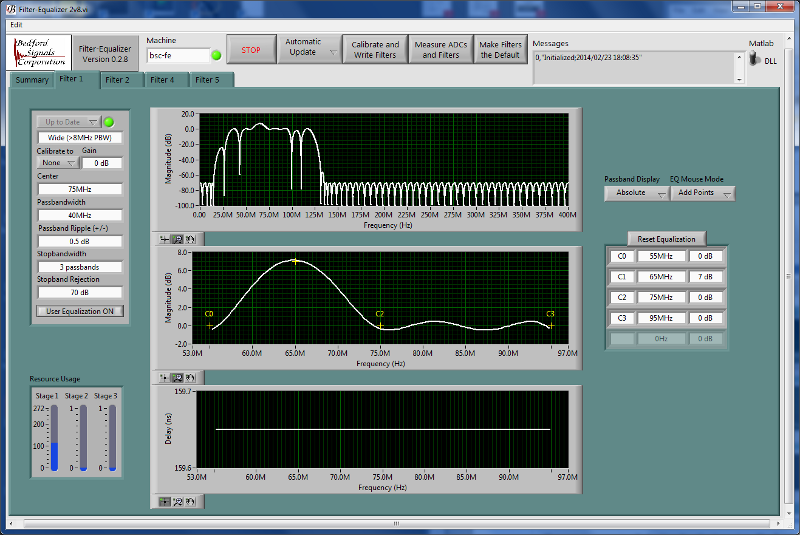 The Fading Channel Emulator Personality includes control pages for 280 MHz wideband delay/Doppler/acceleration/jerk and Doppler spread multipath filtering. Other personalities under development include Multi-Band Phased Array GNSS/GPS Jammer Emulation, Target/Clutter Emulation, MIMO Channel Emulation, Time Delay Beamforming, Frequency Tracking Notch Filtering, and Fast Converging Cancellers.